La Grange is run by Sarah Morrow who worked for over twenty years in the hotel industry. Her meticulous attention to detail means that guests at La Grange enjoy an unparalleled holiday experience. Sarah spends the whole summer in the Charente every year in order to ensure that our guests enjoy the best holiday experience possible and is well placed to provide information and guidance on all the facilities and attractions offered in the area. Chris, Sarah's husband had spent many years visiting the Dordogne/Charente Departments of France. He had wanted to own a house in France since he was 15 years old and was finally in a position to realise his ambition after selling his business in the UK. Chris and Sarah chose the Charente because of its brilliant climate (over 2,100 hours of sunshine every year on average) and the tranquility and rural atmosphere of the region. First impressions count and all of our guests are delighted by the huge, airy, bright spaces of La Grange. Although the house is only minutes from the bustling local town of Aigre, you are truly in la France profonde where the pace of life is gentle and you can forget the pressures of day to day living. But if you want to party, then there are a wide range of activities, restaurants and other facilities within easy striking distance. Our aim is that our guests should leave La Grange with fond memories of an outstanding holiday and a desire to return to the region again in future. En-suite to bedroom 1 has wet room shower. Bathroom suite comprising separate bathroom with bath, separate shower, and separate toilet. Further WC on ground floor. Beautifully converted barn in the heart of rolling countryside with sunflower fields and grape vines all around. 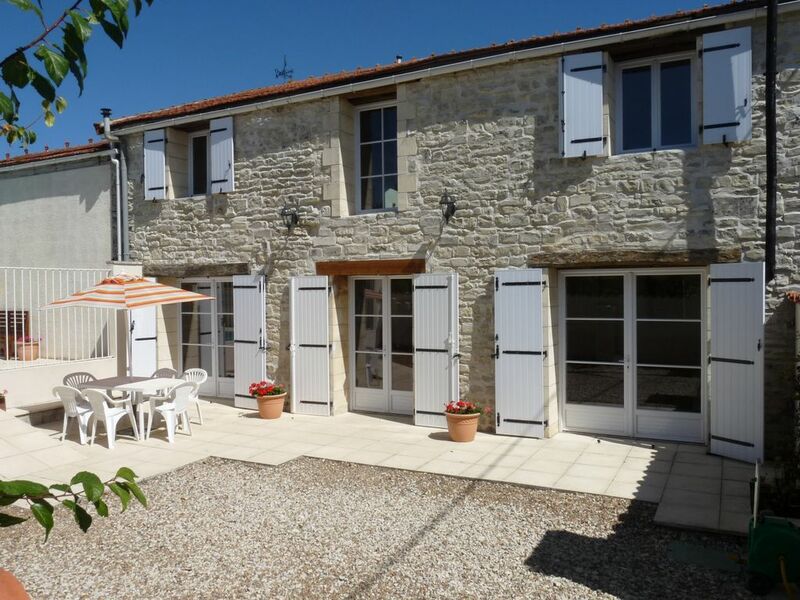 Situated on the edge of a typical Charentais village near to a market town. Full central heating in the barn which can be turned on at guests' request. Unnecessary in summer, but if you are staying there in cooler months then it is available. Available in the house. Access codes provided on arrival. Enormous, vaulted open plan living room with leather sofas leading to separate dining area. Dining table and chairs for up to 10 people. High chair provided for infant. Satellite TV, DVD player, stereo system. Dishwasher for 12 place settings. Dinner service and cutlery for 12 people Serving bowls Pots, pans, cooking utensils. We even helped a group to bake a cake by lending them the necessary kit from our home nearby. Electric cooker with 4 ring hob and oven. Fridge/freezer plus further fridge for drinks. Washing machine. Dishwasher. Microwave. Toaster. Coffee machine. Kettle. Fully equipped with all necessary cutlery, crockery and cooking utensils. Table easily seats ten people inside the house. Outside we have two tables which can be used together to create seating for 10. Orchard garden with mature fruit and nut trees. Swings for children (used at your own risk). Canoes can be hired locally from several different locations. There is an excellent trip from Ruffec where you can travel downstream and the be collected at the end of your trip. Large terrace to the front of the house with table and chairs for al fresco dining. There are tennis courts close by in Aigre which can be reserved. 2 good courses at Angouleme 20 miles and Cognac 20 miles. The house has been unobtrusively designed to accommodate those with mobility problems on the ground floor. All doors are wide enough to allow access for wheelchair users and the en-suite bathroom to the downstairs bedroom is also designed to allow for easy access with a wet room shower. The pool is fully enclosed and gated with lockable gates for security against under age children. Chairs and recliners around the pool. Outside: There is a sunny patio to the front of the house with easy access to the dining room for al-fresco eating. The swimming pool which is for the exclusive use of guests staying at La Grange is equipped with sun loungers and has a shaded hangar with tables and chairs to shelter from the sun. There is a Weber barbecue for the pool area. There is a delightful orchard garden with mature fruit and nut trees where guests may sit in the shade. The garden has a further barbecue. Utility Room: Additional fridge for drinks. Central heating and hot water boiler. Cleaning / Towels / Linen / Maid service: Bed linen and bathroom towels are provided and are changed on Saturdays. Poolside towels are not provided. The property is fully cleaned and prepared prior to arrival of guests. Lots of space, orchard for the kids to play in and a decent-sized pool. Lovely house. Loads of space. Beautiful pool. Very well equipped. We had a fantastic time at La Grange de Chille. The owners were exceedingly helpful both before the trip with travel advice and while we were there with booking activities over the phone. The house is beautiful and unusually has just about everything you would need for a place this big. The location is lovely and quiet. The only issue we had was with the internet which is a little slow - but after speaking to the owner they reset the router and all was ok.
A wonderful break and Chris & Sarah were very welcoming and hospitable. Would def recommend. A lovely property, and very secure - we have a little one prone to escaping. So we had complete peace of mind regarding this! Fab salt water pool, and nice orchard garden with swings. Very relaxing stay. It is always a great pleasure to welcome new guests to La Grange de Chillé. Thank you for your review. I hope we will see you again. Merci à Chris et Sarah pour leur accueil ! La grange est vraiment très bien rénovée. Les enfants ont adoré la piscine ! Merci Gregoire. Nous étions très content de vous recevoir. Séjour du 30 juin au 7 juillet 2018, superbes vacances en famille, au calme. Chris et Sarah sont chaleureux, très bon accueil, visites conseillées du patrimoine, propriétaires discrets mais présents en cas de besoin. Il manquerait juste une climatisation. Y revenir sans hésitation. En un mot génial. Great guests. They were delightful. Would love to have them back. Super locataires. Charmants. Nous espérons qu’ils vont revenir. Et bientôt. Beaches at Royan, La Rochelle, Ile d'Oleron and Ile de Re 60 to 90 minutes away. Airports at Poitiers 50 minutes. La Rochelle 90 minutes and Limoges 90 minutes. Distance from ports: Le Havre 5 hours. Caen 5 hours 30 minutes. Calais 6-7 hours. A car is needed for travelling to local amenities. Local town is Aigre 4 miles. Small town able to provide all everyday necessities. Rouillac 8 miles and Ruffec 12 miles have large supermarkets and greater variety of shops. Angouleme 20 miles is the capital city. Excellent shopping and sporting facilities. Aigre 4 miles has two restaurants, bar, supermarket, banks, petrol station, butcher, boulangerie, hair and beauty salon, various small shops. Market on Thursday with excellent fish. Rouillac 8 miles and Ruffec 12 miles both have large supermarkets and a wide variety of shops. On the 27th of every month Rouillac hosts the second largest street market in France. Angouleme 20 miles has a wide variety of supermarkets, and has excellent shopping facilities and a covered market. Angouleme also offers a wonderful swimming complex with slides, wave machine etc and an ice skating rink. There is also a sporting lake with wind surfing, canoeing, sailing etc. Close by La Grange is a lake with an artificial beach which is great for a day out with picnic. There is a good riding stable with own menage and placid well trained ponies and horses - an evening horse back ramble through the beautiful local countryside is a wonderful way to end the day. Canoeing is offered from a number of centres and you can be taken out to a drop off point in order to paddle downstream for two, four or six hours. There is an adventure park approximately one hour away which has hosted Brad Pitt and Angelina Jolie with their children. Climbing in the trees, zip wires and bungee jumping! The Charente was occupied by the Romans and there are a number of archaeological sites of interest scattered throughout the region. Closest to the house is a Roman amphitheatre situated near Rouillac. The Futuroscope amusement park is one hour away. A great day out for the family. Everyone enjoys the Valley of the Monkeys where you walk among the smaller species. For an energetic day out you can enjoy a ride on the local Velo-train where you pedal along a disused railway track with self operated level crossings. Two of you pedal and up to three may ride as passengers. The race track at Montignac runs regular evening events with trotting races - take a picnic and have fun. Booking Notes: Cancellations may be made up to 8 weeks prior to arrival but thereafter no refunds will be made. Changeover Day: Normal changeover day is Saturday. Guests may arrive any time after 16.00 hours and should vacate the house by 10.00 hours on the day of departure. Please do ask if we can vary length of stay, arrival/departure dates etc. Notes on prices: Prices are based on 8 people sharing the house. A £50 per person supplement is charged for each additional guest above 8 people. No additional charge is made for infants using the cot.